Go Whitewater Rafting for Your Bachelor(ette) Party! 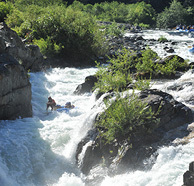 Fun bachelor and bachelorette whitewater rafting trips in California on the American river. Do something different for the bride or groom. A whitewater rafting bachelor or bachelorette party river trip is a great alternative to the traditional Vegas type party. Come outdoors and select our 1/2 day trip, 1 day trip, or go for the full weekend and choose our 2 days of rafting and camping trip package to be sure the bride or groom stays out of trouble and does not jeopardize their relations with the in-laws (just kidding). Planning a river trip to celebrate with your buddies is simple. Give us a call at 1-800-750-2386 or drop us an E-Mail and let us know your groups individual needs. Make a reservation with our group specialist, spread the word, and you’re done! We can set it all up so that the groom or bride goes for free with min of 12 guests. Trip participants can book and pay directly, either by calling our reservation office, or by going online and paying at our secure web site. We provide all the meals, shuttles, equipment & some really fun guides! Private chartered trips available. We even can arrange facilities in the area for weddings, bed and breakfast stays for the wedding party. Having our own private camp area right on the banks of the South Fork of the American River, you can be assured that your group will have their own space. We offer meal options, 4 person Outfitter styled cabin tents with cots and pads, and even our “Honeymoon” Cabin Tent with private space, queen bed, all on a deck overlooking the American river. Trip options can range from fun and mellow to high-adrenaline rush, for all ages and fitness levels, you can even bring the father-in-law! South Fork American River – Half day, one day, and 2 day trip options within 2-3 hours from the SF Bay Area. 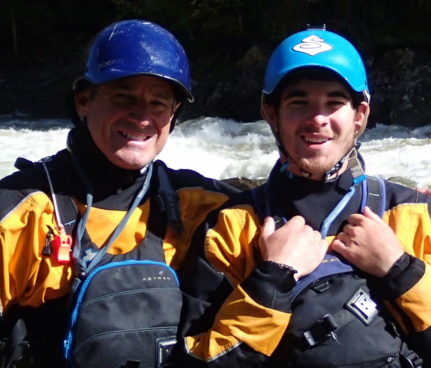 Middle Fork of the American River – our adventurous 18 mile class 3-4 option for those wanting a more exciting whitewater rafting experience. The Middle Fork will deliver and it is available all summer long, due to upstream hydro-electric dam facilities. 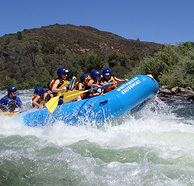 Our most popular option – the American River combo trip! 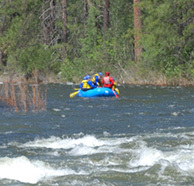 The American river combo trip travels down two totally different rivers in two days. Day one you will raft the “Gorge” section of the South Fork, while Day 2 is spent challenging the class 3-4 Middle Fork’s 18 miles. Also, you’ll enjoy 2 nights of camping at the Whitewater Excitement private camp area right on the river, and 5 delicious meals prepared by our in house cook. Custom Options – We can arrange most anything! If you don’t see anything that drops your jaw, then please give us a call at 1-800-750-2386 or E-Mail us and we would be more than happy to talk about your bachelor or bachelorette party’s special needs or wants. We at Whitewater Excitement would love to share this special time with you.